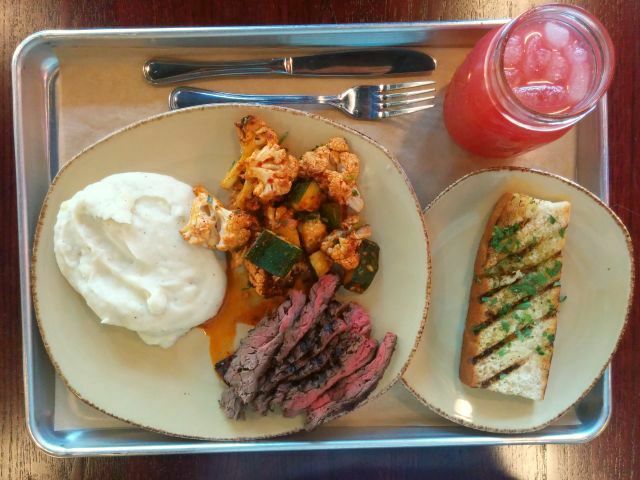 Urban Plates' namesake Plates come with a choice of protein, plus a choice of two sides and chargrilled foccacia, starting at $11. I went with the grilled steak, which cost $12. For the sides, I got organic mashed Yukon Gold potatoes and harissa cauliflower & zucchini. Urban Plate is one of a number of cafeteria-style "fine casual" chains that have become popular and have been popping up a lot in California in recent years. It's basically meant to be a step up from fast casual (in both price and quality) while still retaining the relatively quick speed of fast food. The grilled steak was listed as grass-fed, which tends to leaner and healthier (but also more expensive) but they don't list the cut (which typically means its a cheaper cut). It looked like it could be chuck. It was tender and moist but did not offer all that much flavor and wasn't helped any by a decided lack of seasoning (salt and pepper or otherwise). They might want to consider offering an herb butter or chimichurri on the side to help it along. There was a nice char on the surface though. The potatoes were buttery and creamy with a mostly smooth texture interspersed with the odd chunk. There's a creamy chicken(?) gravy that I got on the side. It added an enjoyable dose of flavor to the potatoes (and was okay with the steak). 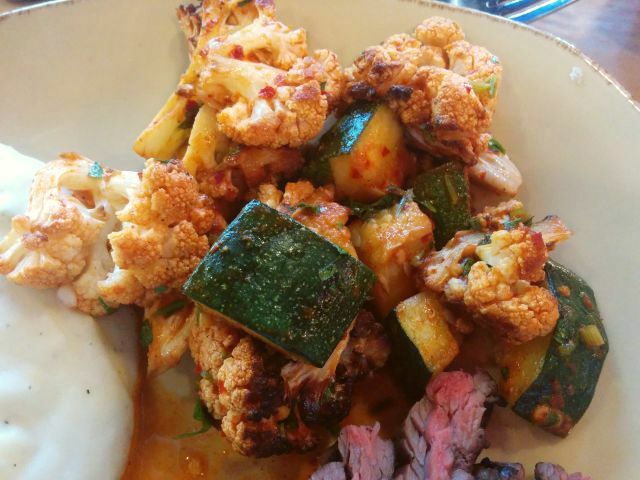 Harissa is a Tunisian hot chili paste and gave the cauliflower and zucchini some heat as well as a bit of oiliness, and was paired with an underlying tomato flavor. It made for a nice accent. The vegetables themselves were cooked until tender but still retained a bit of firmness. 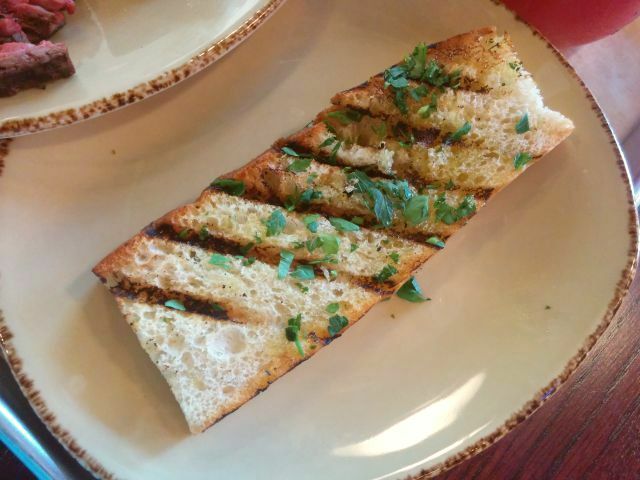 The toasted foccacia was nicely toasted, while still soft underneath. It was brushed with olive oil and some herbs for flavor. 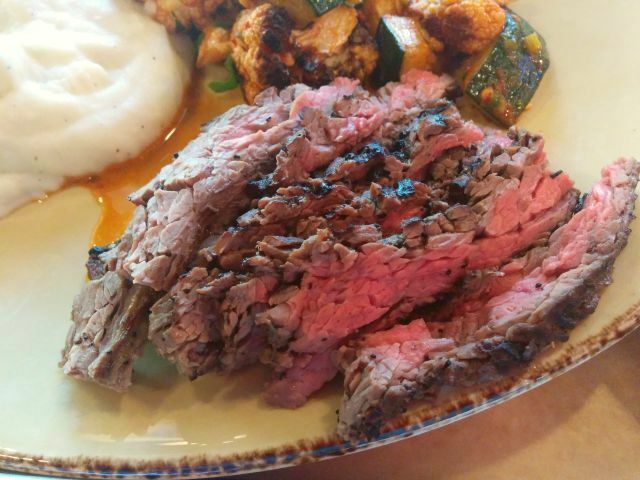 Overall, I liked the sides that I chose for Urban Plates Grilled Steak Plate but the steak was lackluster taste-wise. Additionally, due in part to the cafeteria-style set up, by the time I paid for my food and sat down, my food was mostly lukewarm (including the steak). It's fine if you go with cold sides or a salad but not-so-great otherwise.